It’s been beautiful weather this week – in London, anyway. Spring has sprung and the sun encourages some reflection in our dress. Which means more than just a pair of sunglasses. The wonderful thing about this time of year is the flowers that are available if you want to wear a boutonniere. There are some kind of flowers available most of the year, but never as many as in Spring. Wearing a flower can seem like quite an extravagant thing to do, but actually I would argue it is more natural, casual and subtle than most things that make a sartorial man stand out – bright patterns, bow ties, tie clips etc. Of course, flowers won’t last all day, and are therefore often nicest for events in the afternoon, or meeting someone in the morning. You can hide a little vial of water behind the lapel to keep a flower happier for longer, but that’s too fussy for me. Here, a crocus from the garden in the lapel of my Anderson & Sheppard grey-flannel DB suit. With grey linen handkerchief, white edging. You can follow the discussion on Wear a flower in your buttonhole by entering your email address in the box below. You will then receive an email every time a new comment is added. These will also contain a link to a page where you can stop the alerts, and remove all of your related data from the site. Hmmmm, not to sure of this one. I must admit I didn’t read buttonhole… Thought I had stumbled upon a very NSFW website indeed! Simon, the beautiful weather you mention (here in Tokyo too) has got me thinking that I had better get moving on my next commission – a navy summer suit. I am choosing between a Japanese high twist mohair/wool hopsack and a Martin Son’s and Co. Fresco (for some reason not Marketed as Minnis here…). The fabrics look pretty similar (though the mohair has slightly more texture) so the choice will probably come down to which will functionally be superior in terms of coolness (the summers are brutal here! ), crease resistance and longevity. Do you have any thoughts on their relative merits in this regards for a summer suit? I was once advised that dipping the end of a freshly picked flower into candle wax to seal it will help a great deal to extend its life into the day. Worked for me so far. Great tip Oskar, but isn’t there a risk the wax from the candle will leave a stain on your jacket? PS after months of freezing weather, it finally felt like spring this week in NYC. Not quite sure I’m ready for a buttonhole flower, but it’s certainly nice to start thinking about summer fabrics again! Cling film should do the trick. You could also add a wet cotton wool and then wrap it up. Very nice. Where is that pocket square from? 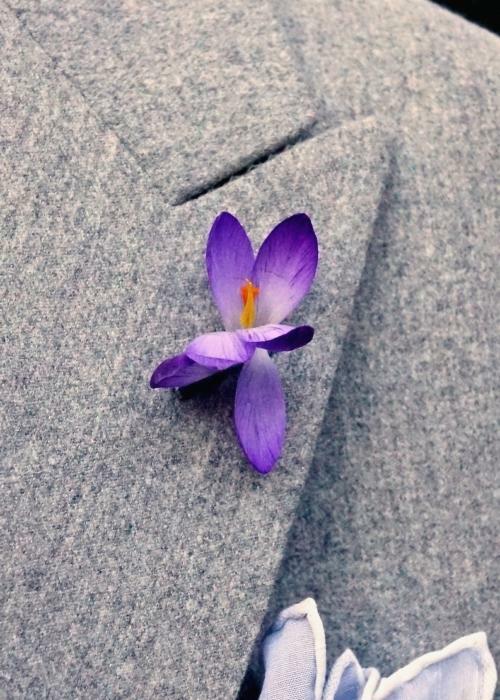 Flowers don’t risk to stain the lapel (especially if the suit is light)? Not risk to stain or twist the buttonhole (especially if is milanese buttonhole)?